A restored former railway station on the fabulous Monsal Trail just a mile outside of Bakewell. Hassop Station Café serves delicious food and has its own cycle hire, bookshop, gift shop and ice cream kiosk. We absolutely love unique places like the café at Hassop Station which celebrates local history and provides a welcoming place for a hearty meal or snack after spending a day in the fresh air enjoying the surrounding countryside. Frequented by walkers, cyclists and horse riders out enjoying the Monsal (or Cake) Trail which runs for 7.5 miles from Bakewell to Wyedale, you absolutely have to stop here if only to try Hancock’s Pork Pie with Ibbotson’s Pickled Onions. It’s the sort of place where you can order a chip butty or posh fries with truffle oil and shaved Parmesan. 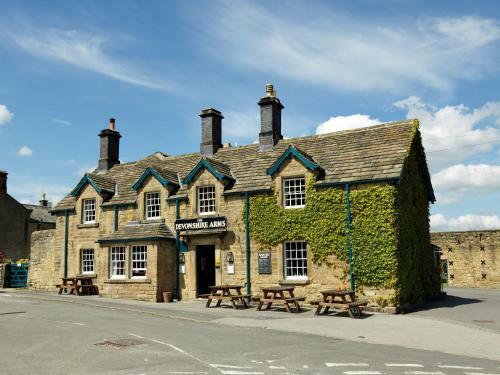 Hassop Station is a handsome stone, former railway station which was originally on the Derby to Manchester main line between Bakewell & Great Longstone stations. It was one of the three stations for Chatsworth House, the home of the Duke of Devonshire. In 1964, Hassop Station was closed to goods traffic. The old railway track is now the Monsal Trail, a walking, cycling and riding route stretching from Bakewell to Black Brook cottages in Buxton. Having been closed since the 1960s, the Monsal Trail tunnels finally reopened in May 2011, taking visitors through lit tunnels and on into some stunning scenery, notably Monsal Dale with its magnificent viaduct. If you’re starting out from the Bakewell end of the Monsal trail, grab a hearty breakfast here or, on the way back, stop for Afternoon Tea (they do a mean Victoria sponge cake), or cool off with an ice cream from Hope Valley Ice Cream. The menu is surprisingly extensive and the café is licensed so you can enjoy a local beer or a glass of wine. There’s a lovely terrace overlooking the trail and a trail lookout post. If it starts to rain, retreat indoors or to the large outdoor covered seating area at the station entrance. Sit down and read the papers or buy a book from the excellent bookshop. It’s stocked with intriguing titles that will make you want to explore more of the local area and there’s a great Craft and Cookery section where you’ll find books such as ‘Bake Yourself Happy‘. Definitely our kind of place. Discover more Railway Cafés and Train Dining Experiences and see our recommended Gifts for Train Lovers.